The Goals You May Have Never Thought Possible (Until Now)! Welcome! I am so happy you’re here today! “When You Visualize, Then You Materialize. • Live in your magnificent dream home (whether it’s a luxury mansion or a canvas tent you pack up each day as you travel the world)? • Own and enjoy fantastic cars, motorcycles or other wonderful vehicles? • Take amazing vacations and travel to the destinations you’ve always wanted to see? • Enjoy abundant luxuries (whatever “luxury” means to you personally)? • Experience deep passion and romance in your life? • Love your beautiful body? • Give inspiringly and generously to others in your life (or in the world) who are less fortunate than you? If you’ve answered yes to any or all of the above, then this course is for you! Because the only way to have and do these things is to first believe they are possible thereby setting in motion the Universal Laws that will turn these dreams into reality. Revolutionize Your Life And Reprogram Your Subconscious Mind Through The Maximum Potency Practice Of Conscious Visualization. During these 49 days of conscious visualization, you will “step outside the box” with several ways to approach the areas of your life so that the categories you focus on will fit within your personal lifestyle and desired outcome. For instance, if you are not interested in a “romantic relationship” there are other ways you can approach that category which will be perfectly fitting for your lifestyle. 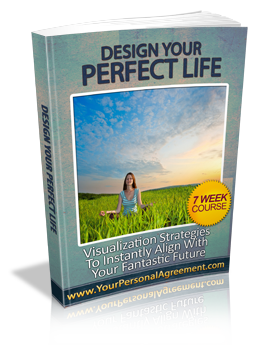 And when the course is over, you can continue using these tools to design and create your perfect life in any other ways you wish! Finally Align Themselves With Their Dreams! Sign up for this course and powerfully reprogram your subconscious mind while designing your life for the next 7 weeks. 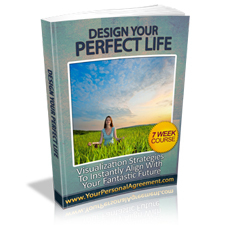 Once you have a complete understanding of exactly how to use these tools, you can continue using them to create your perfect life in any other areas! Revolutionize your life and reprogram your subconscious mind through the maximum potency practice of conscious visualization. When you visualize, then you materialize. If you've been there in the mind you'll go there in the body. I have taken great care in assembling the tools that I know from personal experience will help you clear away any blocks, reprogram your subconscious mind and joyfully align you with the things in life you want for yourself. I hope you will take this opportunity to design your life exactly as you want and deserve it to be! NOTE: Due to the nature of digital downloads and the exceptional value included in this 65% off special offer-there are NO refunds. So if you are unsure in any way of the importance of transforming your life with these tools today, please pass on this offer and allow someone else to utilize these tools.